After the events of episode 5, we get to see the kinda odd reasoning behind why Banjou turned Sento’s friend Tetsuya back into a SMASH after Sento saved him using NinninComic. We also get an explanation behind what the gas is that Faust is using to turn humans into SMASH as well as a little more of an explanation behind Blood Stark’s actions. We unfortunately don’t get to see a new Best Match this week, unless you count the preview for the next episode, but we do get to see a new Trial Form when Sento decides to match up the Ninja and Tank Full Bottles, which was a little interesting. We also find out what happens when someone other than Sento tries to use the Build Driver when we see Banjou attempt to use it. This week’s episode begins with Banjou following the SMASH he reverted to the Skywall where he’s attacked by some Government Guardians and Officers. He is almost arrested but Build in NinninComic form intervenes and saves him. 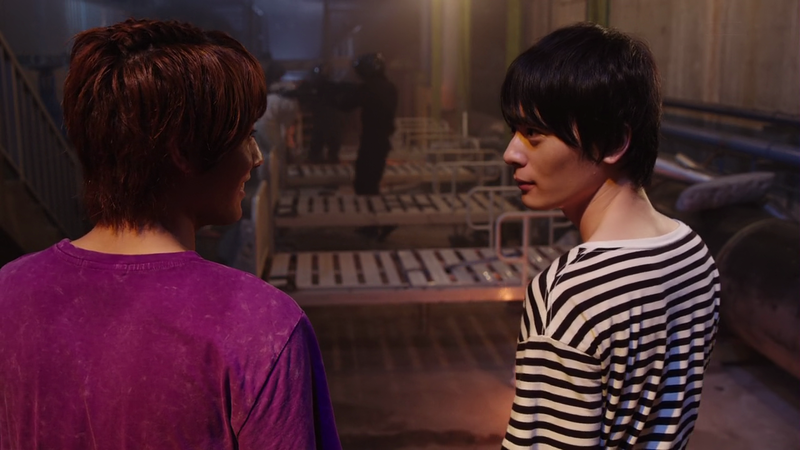 We then see them back at their base as they start arguing and fighting each other which leads to Banjou trying to use the Build Driver and Sento explaining that it isn’t one size fits all. We also see Sento notice that the Dragon Full Bottle has changed since Banjou has had it. After that, we see Night Rogue and Blood Stark talking about Blood Stark raising Build’s Hazard Level as well as Owner explaining to Banjou why Sento feels the need to try to save everyone from Faust. We also see Sento doing research on the Skywall when Gentoku Himuro explains to him that it emits a gas from underground that’s made up of minerals not found on Earth. We also see Misora and Sawa chatting about relationships when Sento walks in and declares his love of openings. He then tells Banjou about the opening and they plan to attack Faust HQ, which is hidden under the Skywall. We then see Gentoku talking to someone on the phone about showing Sento the data on the Sky Wall. With Sento and Banjou at the entrance that Sento found and while they are talking, Sento gives Banjou a new invention he came up with in the form of a mini Dragon he made for Banjou. They then proceed to sneak past patrols as they break into Faust HQ under the Skywall. Once they’ve made it past the patrols into Faust HQ, we see some scientists in hazmat suits experimenting on someone. They start to run away, scared by the sight of Banjou and Build. We then see Sento having some flashbacks while Banjou interrogates one of the scientists about who framed him. Blood Stark appears and attacks the fleeing test subject. We then discover that Sento and Banjou are unique in that they were dosed with enough Nebula Gas to turn then into SMASH but neither of them changed. Banjou is then poisoned by Blood Stark but his new toy Dragon saves him and spits out the poison. Meanwhile, Sento loses his temper and attacks Blood Stark. As Blood Stark leaves, Banjou calms Sento down by reminding him what Banjou asked was most important to him. We then see Sento and Banjou save Tatsuya by turning him back then they narrowly escape the Faust facility before it explodes. As the episode reaches it’s end, Tatsuya explains to the pair that he delivered Sento to a new part-time job making medicine at Katsuragi Takumi’s place who’s murder is blamed on Banjou. It’s revealed that Sento was there a full hour ahead of Banjou and could’ve seen who killed Katsuragi Takumi or that Sento could’ve been the one who killed him. So all in all, it was quite a nice and informative episode where we learnt a little more about Sento’s past as well as finding out that Faust has multiple facilities hidden under the Skywall. We also find out what they are using to create SMASH. In my opinion, it was a good episode as it filled in more blanks as well as progressed the story a bit more. I’m excited to see what happens in regards to Sento and his memories as well as the dynamic between Sento and Banjou. So that’s it for this week’s Kamen Rider Build review. Do you think Banjou’s Dragon may be a hint as to what’s to come? What’s your opinion on the Katsuragi murder and who’s guilty or innocent? Share your thoughts in the comment section below! Previous post: Kamen Ranger’s Ramblings: Mask or Helmet?